On October 8th Intel is set to announce its 9th Gen Core series. It took many months, but Intel is finally ready to answer Ryzen’s 8-core CPUs. The Core i9-9900K will likely become a CPU of choice of many GPU reviewers, where single-thread performance is still the most important factor. 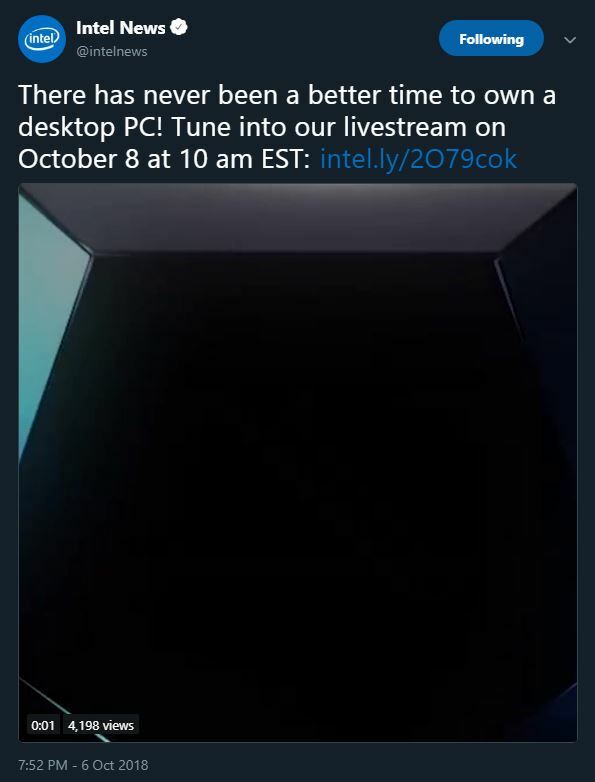 Intel is now teasing their launch event, which will take place in New York on October 8th at 10 AM EST. The event will be live-streamed, hopefully, it will be much less cringe-worthy than the last desktop launch. The tweet posted by official Intel account shows the new Core i9 packaging made for the new 9900K CPU, which was leaked few days ago by Amazon (more pics here). We have been hearing rumors that Intel is also planning to talk about HEDT CPUs, more specifically Basin Falls Refresh. Although no trace of such products has been found.